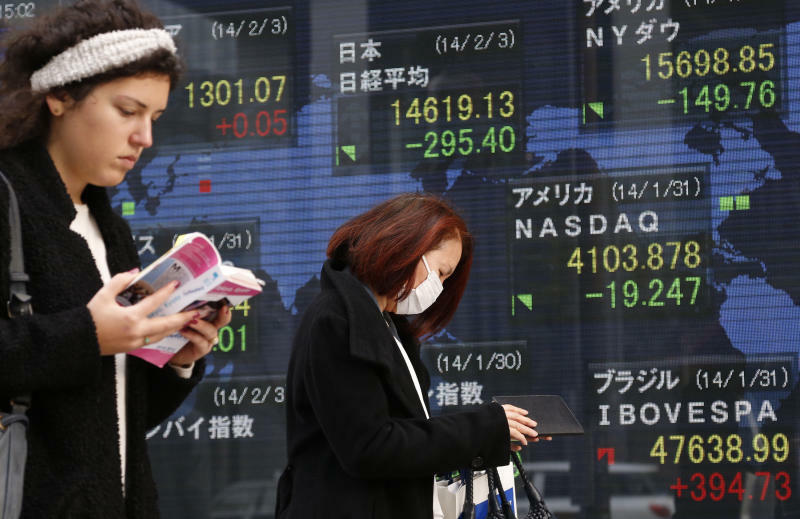 TOKYO (AP) -- Global stocks were mostly lower Monday as signs of weakness in another China manufacturing survey added to lingering jitters about developing economies. In early European trading, major benchmarks were lackluster. Britain's FTSE 100 inched up 0.2 percent to 6,522.24 but France's CAC-40 was down 0.1 percent to 4,163.23. Germany's DAX fell 0.1 percent to 9,293.72. Futures augured modest gains on Wall Street, with Dow Jones and S&P 500 futures both up 0.1 percent. The Nikkei 225, the barometer for the Tokyo Stock Exchange, closed down 2 percent at 14,619.13 as the yen has reversed some of its weakness against the dollar in recent days, which is a negative for exporting stocks. Also negative for sentiment was an official Chinese manufacturing survey that showed factory output grew at a slower rate in January compared with December. The survey released on the weekend followed a HSBC survey that showed a contraction in China's manufacturing. Markets were closed in Hong Kong, China, Taiwan and Malaysia for Lunar New Year holidays. Seoul's Kospi dropped 1.1 percent to 1,919.96. Among the Asian markets open for business, only Thailand posted gains after national elections took place Sunday without major violence. Australia's S&P/ASX 200 fell less than 0.1 percent. The financial markets in several developing countries including Turkey and Argentina have been shaken recently by concerns that growth will slow and money will flow out of their economies as the U.S. Federal Reserve tightens its monetary policy. That has knocked many stock markets, which were ripe for a pullback after big gains in 2013. Jitters about emerging markets continued to be the main focus for investors, said Hiroaki Hiwada, strategist at Toyo Securities Co.
That in turn was fueling buying of the yen, which was being viewed as safe haven, and that was helping send regional stocks lower, he said. The stock fall in New York was also weighing on investor sentiment, he said. "There is little good news to trade on. Maybe by next week, people will start to buy shares back," said Hiwada. On Friday on Wall Street, the Dow Jones industrial average fell 149.76 points, or 0.9 percent, to 15,698.85. The S&P 500 dropped 11.60 points, or 0.7 percent, to 1,782.59 and the Nasdaq lost 19.25 points, or 0.5 percent, to 4,103.88. Benchmark U.S. crude for March delivery was down 51 cents at $96.98 a barrel in electronic trading on the New York Mercantile Exchange. The contract fell 74 cents to close Friday at $97.49 a barrel. The euro was little changed at $1.3480. The dollar rose to 102.12 yen from 101.96 yen late Friday but is down from about 105 yen at the beginning of the year.